TRACE Members enjoy unrestricted access to our Online Training Library and Customizable Training Platform and may train an unlimited number of their employees and third parties. Request a demo account today. Build a legally-defensible online training program that withstands regulatory scrutiny. Mitigate the risk of compliance violations by providing employees and third parties with the knowledge they need to comply with key regulations. Improve learner engagement and retention by leveraging gamification strategies. 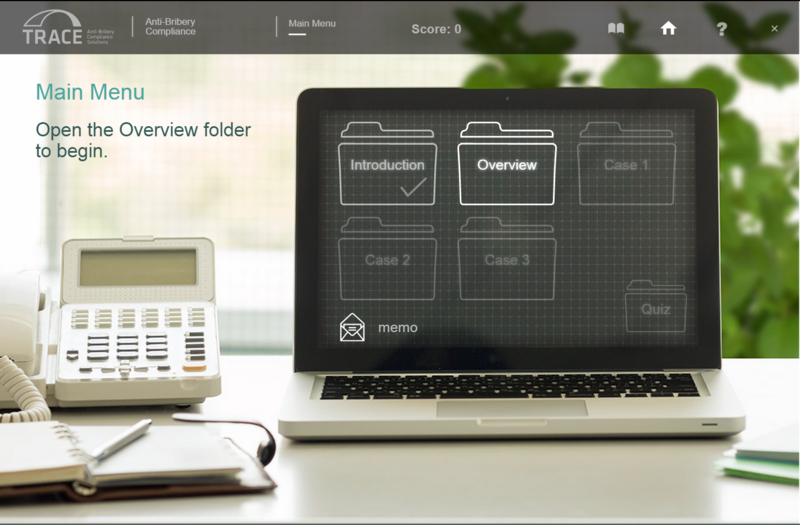 Keep pace with evolving regulations and innovations in eLearning. 20-30 minute courses that cover key compliance issues, introduce employees and third parties to the law and teach learners how to take appropriate action when faced with a potential issue. 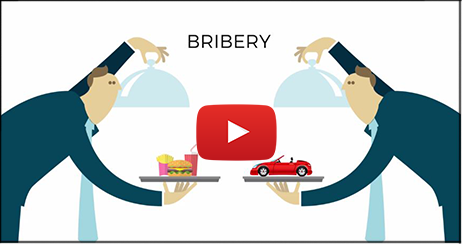 Learn what constitutes bribery and how to identify the many forms prohibited by global anti-bribery laws. Recognize and avoid bribery in real world situations and acquire the skills necessary to analyze cases. Gain awareness of the risks bribery poses to companies and individuals and prevent violations from occurring. *Available in two versions, one for employees and one for intermediaries. View the course trailer in English. 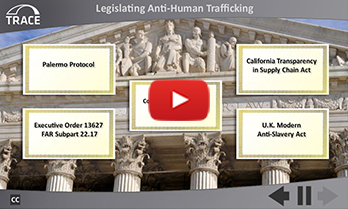 Learn how to comply with trafficking-related statutes, including the UK Modern Slavery Act and US FAR requirements. Recognize and communicate awareness of human trafficking risks. Formulate a plan to identify and avoid trafficked labor in your business. View the course trailer in Arabic, Chinese, English, French, German, Portuguese, Russian and Spanish. Recognize different types of conflicts of interest in the workplace. 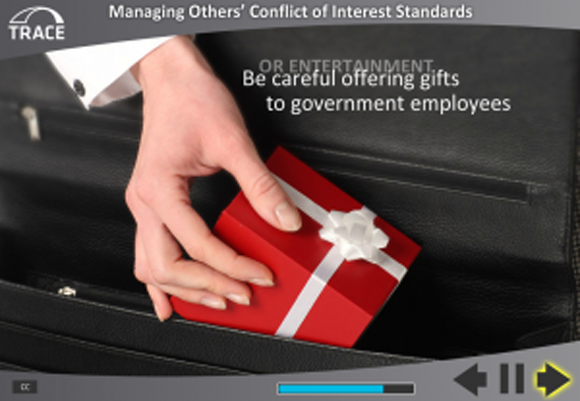 Learn how to take appropriate action when faced with a conflict of interest. Understand the harmful effects that conflicts of interest can have on individuals and companies. Learn what conflict minerals are and who is affected. Understand what steps companies and individuals should take to meet reporting and due diligence requirements. Identify and address additional expectations on suppliers. Learn what sanctions are, their purpose and which activities may fall under sanctions. Recognize how day-to-day business activities may be impacted by sanctions. Identify red flags and assess real-world situations to determine if sanctions are implicated. Learn what money laundering is, types of money laundering and why it is done. Identify signs of money laundering that may arise on the job. Understand the steps you can take to prevent money laundering. 15-minute courses for employees in higher-risk positions, designed to keep key compliance issues top-of-mind in between annual training cycles. Recognize the various factors that influence compliance risk in gifts and hospitality practices. Learn how to make decisions regarding what gifts and hospitality expenses are appropriate. Understand how to avoid situations that could get you and your company into trouble. Understand the basics of international anti-bribery laws and how third-party due diligence fits into compliance with these laws. Mitigate compliance risks in actual third party business interactions through due diligence on third party intermediaries. Learn how to make decisions regarding whether or not to further investigate or process with business interactions involving third parties, given background circumstances. Courses are available in up to 29 languages. Download the online training brochure for more information. TRACE Member companies can train an unlimited number of their employees and intermediaries at no additional charge. Courses in up to 29 languages on key compliance issues for employees and third parties.